Today is a quiet day in my office as I prepare for this weekend. It is Dallas’ day off so I’m in the office on my own, writing a puppet play, preparing a sermon, resisting the urge to eat all the chocolate bars on the table – waiting for Sunday, when it is time. It is nap time at the day care that shares our building, and my soul, too, is quiet. I feel peaceful. It is good to prepare for Easter with a sense of peace. Last year I did not feel feel peace as I waited for Easter. Holy Week 2013 was a week of great fear and anxiety for me. I write in the peace, even as I remember the chaos. It all connected to the struggle of living far from Roxanne, while also having two small children at home. I wanted to be able to be with her as much as I could; I also wanted to be intentional about making wise decisions about when I would go to visit so that my absences weren’t too hard on my children. It was infuriating because when someone is in the final phases of cancer, no one can give you all the definite answers that you want: How much longer? When should I come home? Will she live for days, or weeks, or months? Will I fly home now, only to come back and wish I’d waited a little longer so I could be there when she needs me most? Should I fly home now so that I can still see her when there are glimpses of her left? For about the millionth time in my life I would have liked to have a nice memo from God with a detailed calendar of what was to come, but, of course, it doesn’t work that way. Roxanne had been feeling poorly for a while, but we thought it was the treatment. I truly believed that after she was done the treatment that we would have a few more “good weeks” (even months?) for me to visit and spend time with her again before the cancer took over. In fact, during a visit I had with her in February, she took me for lunch on our last day and said “You know this could be our last lunch out together.” “Of course it won’t be,” I said, “I’m going to come back again when your treatments are done and we’ll go out for lunch every day if you want!” I really really believed in February that there would be more “good” time left when her treatments were done. Holy Week was when I realized that there wouldn’t be, that that lunch had indeed been our own “last supper.” Roxanne stopped her treatment after her doctor’s appointment and was even sicker than before, so we had to admit: the treatment was not the only thing making her sick all that time. The cancer had been raging all along. Stupid cancer. Roxanne would grow sick past the point that I could talk to her before I got home. Her daughter, Laura, who had gone on a school trip to Europe for Easter break and was not due back until the end of the week after Easter, would not make it home in time to see her mother alive again. Both of these ideas kept me up at night. Roxanne just seemed so sick. I couldn’t imagine she had much time left (of course, I did not understand how much worse it would actually get…Stupid cancer). Everyone assured me it would be fine. None of her doctors or nurses or caregivers saw any signs her death was imminent. But she was still dying. And I was still in Ontario. “Not imminent” was small comfort. And I was so unsure and confused and stressed that I didn’t feel like I could make the decision to change the flight and just go earlier and I couldn’t decide not to. So, I just trusted the prayers for wisdom that had led me to book my flight when I did and I waited. Still, most days I felt like I was failing as a sister. It was one of the most critical seasons in her life and I wasn’t there. Today I read the story of Peter, one who loved Jesus and promised to follow Him to the very end. And if I had a sword to hack away cancer I would have attacked it, too – time and time again. But then it got scary for Peter. His association with Jesus left him in a precarious position. He followed Jesus as he was led to the High Priest for questioning, but he stayed in the courtyard, at a distance. Already failing at his promise. Jesus was in trouble and he was in the courtyard. My sister was dying and I was half a country away. Many of us know what happened next for Peter. Asked three different times if he knew Jesus by those within and around the courtyard, Peter said he did not. After the third denial, he heard the rooster crow. 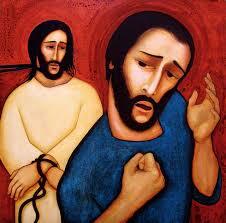 Jesus had been right: Peter wouldn’t stay with him, despite his best intentions. My sister had been right – there was not another lunch out, despite my best intentions. As we grow closer to Good Friday, I join with Peter in his story – not just as someone who journeyed with the loss of a loved one, and who has all the normal guilt and questions that surround that, but as someone who also knows that on my journey to Christ I often come up wanting. I want to do more. I want to be true to my faith in all things. I want to stay strong when the hardest challenges face me. I tell Jesus over and over all about how I want to be. Holy Week is when we lament that, like Peter, our good intentions will never be enough. My good intentions aren’t enough to make me the follower of Christ I want to be. My good intentions weren’t enough to make me the perfect sister that I wanted to be. The joy is that Jesus didn’t ask for good intentions. He didn’t ask for good at all. He came to invite us into a story because of His good, not our own. And in that story, the one we have entered this week, it is just a few days until Peter will run to the tomb and realize what he didn’t understand before: that Jesus’ story was bigger than Peter’s own part in it. Peter’s job wasn’t to shape Jesus’ story – it was to let Jesus shape his. Two days after Easter, I arrived back in Newfoundland to “the best day” Roxanne had had since her health had turned. She came to the living room and sat with us for a while. She played a little bit on the piano. We were thankful that they found a new combination of medications that helped provide better pain management. I like to think that the improvement had a teensy weensy bit to do with me showing up – but the truth is it was my story that changed when I got there, not Roxanne’s. She didn’t need me nearly as much as I needed her. I stayed for ten days. I helped her pick out pictures for her funeral slide show, I watched TV with her when she was up for it, I moved her favourite flowers close to her so she could see them best. I was there when Laura got home from Europe full of stories and the special joy she always brings and heaped love and presents on everybody. I was there when she gave her mom a flowing pink scarf from Italy that Roxanne immediately put on her head with a smile. And she looked beautiful. I was there to learn about peace. And this Holy Week, though I am sometimes sad, I am not anxious. Thanks for posting these blogs Leanne. Bringing back memories of when we had a “blog” on the youth website when a blog wasn’t even a thing yet! It’s been very touching to read these posts as you reflect back on a year ago. I hope they’re helping you on your grieving journey as much as they’re inspiring me. Sunday is COMIN!!!!! Thank-you Jen!! Yes, I think I have copies of all those “Thoughts for the Week” somewhere. It would have been nice to have this format so that we didn’t have to type all the html commands all the time! Thanks for still reading 15 years later!